With the first two regions EPs already released and the North American edition out this week, ‘Vs The World’ - Richard Durand’s unique, collaborative new album - is rolling hard! 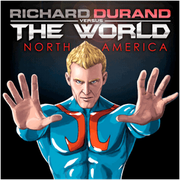 The penultimate regional round of the Richard Durand vs. The World contest is now opened and now it’s the turn of Africa and the Middle East. The Progressive Brothers, Dennis Sender and, most recently, Huge Euge have become the first fledgling artists to become co-producers on this audio-odyssey. Created from the track stems Richard has been placing online since last November, their studio work has been making the cut on club floors worldwide. Entrants can head to Richard’s website now, click ‘Download’ on the App and grab his base track. The direction you take it in from there is entirely up to you, tempo, feel, angle and atmosphere – it’s all in your hands. Apply your melodies, FX, top-lines, bass, percussion and kicks. You can network with other likeminds online to create it: you produce/they sing, vice versa, or whichever dynamic works. Once your opus is complete (you have until June 18th to complete and deliver), head back to the website, click ‘Upload’… and put that opus into contention.